In August of last year, Marchesa designers Georgina Chapman and Keren Craig unveiled a new lower-priced contemporary line, Marchesa Voyage. While Marchesa Voyage maintains the elegant aesthetic of their main line, this new line was created for daytime wear and is much less expensive. You’ll find flowy sundresses and draped blouses, beautiful floral prints and feminine silhouettes in the Voyage resort ’14 collection. I can’t wait to see what they have in store for spring! All the pieces range from $200-$1,000 – much more affordable than their evening-wear collection. The collection is currently available at Shopbop and Saks Fifth Avenue. Shop pieces from the collection below – this flirty silk dress (also available here) is my favorite! PS – how fabulous is this black + gold sequined jacket that’s on sale from their fall collection? Obsessed. Marchesa makes such beautiful clothing so of course this collection is pretty. That black and gold jacket is killer. Such a beautiful collection! I need that off-the-shoulder dress! Such a stunning collection! I’m in love with that off the shoulder dress. Gorgeous! Makes me wish it was warmer in NY, love that striped jacket! I think I can convince myself that those pants are a spring necessity! Hope you’re having a lovely week! Could this collection be anymore pretty? I love the floral and stripe combination, just impossibly pretty. Marchesa can do no wrong. As soon as Voyage came out my mom and I have been obsessing over it. 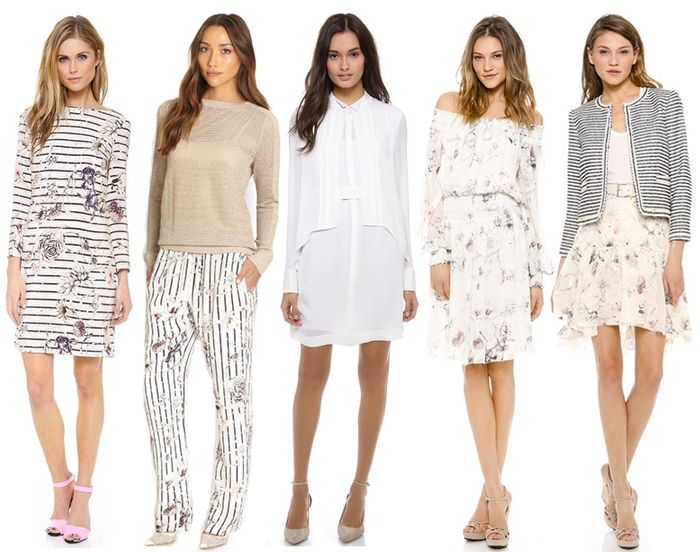 I have my eyes on the striped/floral dress! So perfect for spring. Oooo, I love these! So gorgeous! Those floral prints are amazing. Love the pattern on that silk dress!! It’s so sweet and perfect for spring…. which needs to come ASAP! That collection is gorgeous and totally my style. That first dress totally in love! I’m in love with this collection!! I like the collection…it’s romantic. First of all I have a mild obsession with Georgina. I think she is so fabulous. And Marchesa is like the ultimate feminine line. I can always spot if something is Marchesa – their dresses look like nothing else out there!! I love all of these pieces. I must go check out the entire line. This line is new to me. Love the floral prints! We adore that off the shoulder silk dress. It’s beautiful!